26 February 2015. A new registry of patients with psoriasis will track the safety of a recently approved biologic drug designed to treat that disorder. The Corrona Psoriasis Registry is a joint undertaking of National Psoriasis Foundation and Corrona LLC, a company in Southborough, Massachusetts hosting registries of patients with chronic diseases. Psoriasis is an autoimmune disorder, where the body’s immune system is tricked into attacking healthy cells, in this case resulting in inflammation and red, scaly patches of dead skin cells typically in the scalp, or near knees and elbows. According to the foundation, some 125 million people worldwide have psoriasis, including 7.5 million Americans. Corrona and National Psoriasis Foundation say the registry will begin with collecting and analyzing safety data of the biologic drug secukinumab, marketed by the pharmaceutical company Novartis under the brand name Cosentyx, and approved by Food and Drug Administration in January 2015. The drug works by binding to the interleukin-17A cytokine, a protein that activates inflammation. By binding to this protein, Cosentyx blocks interleukin-17A from binding to its receptor that triggers the inflammation, thus preventing the red, itchy scales on the skin. FDA approved Cosentyx for plaque psoriasis patients who qualify for systemic therapy — treatments that go through the blood stream — or treatments with ultraviolet light, or both. The drug is given as an injection under the skin. Under terms of the approval, Novartis is preparing a medications guide with warnings about potential effects of Cosentyx on the immune system, including reports of serious allergic reactions. The most common side-effects of Cosentyx are diarrhea and upper respiratory infections. 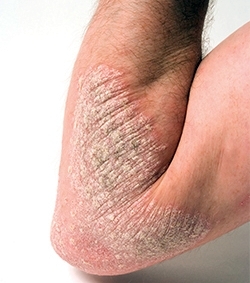 The Corrona Psoriasis Registry is expected to enroll some 3,000 people with psoriasis taking Cosentyx and follow their treatment for at least 8 years. Patients with psoriasis and their physicians will complete up to 2 registry questionnaires per year during office visits. Corrona provides patient registries for rheumatoid arthritis and spondyloarthritis, a collection of related inflammatory rheumatic diseases that cause arthritis, as well as psoriasis. Its registries are designed to capture data about the long-term safety and effectiveness of drugs that are rarely, if ever, collected in clinical trials. The company says data for registries are screened by biostatisticians, and made available to researchers to assess drug safety and effectiveness over time, as well as better understand the nature of the disorders.